Boat is located in Deltona Fl.Please contact the owner @ 863-443-2278..13.6 NIGHTHAWK,composite hull , 480 cid Lycoming Supercharged engine..less than 60 hr.s since total rebuild, composite prop, also have hub for 3 blade prop plus the 3rd blade. 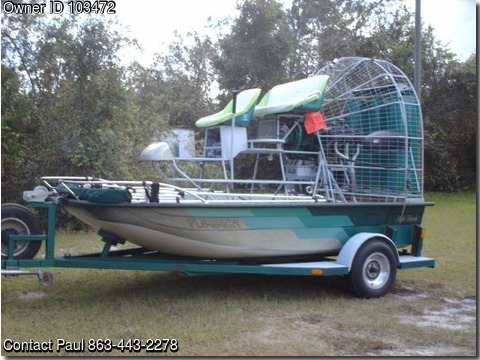 Bimini top , tilt trailer C OMES with extras: new 40 gal gas tank, set of downsized rudders, add'l 4 cylinder/large bore/200hp?/Franklin engine with carb. and updraft intake system plus exhaust headers (for parts or repair) . Includes manuals for both engines. Plus misc odds & ends related to airboats. Not to be sold seperatley Call me !